RIO DE JANEIRO, BRAZIL – Today, May 5th, the Getulio Vargas Foundation released the Brazilian inflation index rates showing that the Consumer Price Index – Class 1 (IPC-C1), which measures the change in prices of goods and services, for families with incomes between 1 and 2.5 minimum monthly wages, rose to 0.69 percent in April. 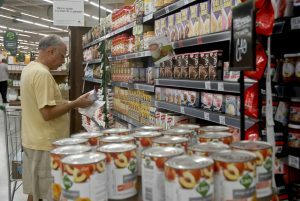 Inflation for low-income families on the rise, photo by Tania Rego/Agencia Brasil. This was an increase from the March index of 0.44 percent for the same class. The IPC-C1 index is higher than the Consumer Price Index – Brazil (IPC-BR), which measures inflation for all income levels throughout the country. The IPC-BR stood at 0.49 percent in April. To date, the IPC-C1 cumulative inflation rate is 3.82 percent for the calendar year and 9.94 percent in the past twelve months, which also outpaces the IPC-BR index for the same period, 9.24 percent. The Consumer Price Index in Brazil is determined by measuring the monetary value of eight classes of expenditures. According to the report, the high IPC-C1 index between March and April was caused by increases in four of the eight classes: Health and Personal Care, increased from 0.36 percent in March to 3.49 percent in April; Transportation, increased from 0.19 percent to 1.12 percent; Clothing from 0.37 percent to 0.82 percent; and Education, Reading and Recreation from 0.42 percent to 0.52 percent. The four other classes of expenditures showed index decreases with Power, dropping from 1.21 percent to 0.62 percent; Communication, from 0.69 percent to 0.04 percent; Housing, from 0.46 percent to 0.43 percent, and Miscellaneous Expenditures going from 0.97 percent to 0.29 percent.